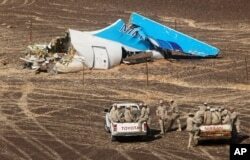 In this Russian Emergency Situations Ministry photo, Russian Emergency Ministry experts work at the crash site of a Russian passenger plane bound for St. Petersburg in Russia that crashed Saturday in Hassana, Egypt's Sinai Peninsula, Nov. 2, 2015. President Barack Obama said Thursday that he "thinks there's a possibility" a bomb destroyed a Russian jetliner over Egypt last week, killing all 224 passengers and crew. Obama told KIRO radio in Seattle, "We're going to spend a lot of time just making sure our own investigators and our own intelligence community find out what's going on before we make any definitive pronouncements. But it's certainly possible that there was a bomb on board." British Prime Minister David Cameron said he thought it was "more likely than not" that a bomb brought the Russian jet down. However, speaking before talks Thursday with Egyptian President Abdel Fattah el-Sissi in London, Cameron noted that experts were not yet certain of the cause of the crash. Russia's government has rejected the theory that the crash was caused by an explosive device on board, saying it is too early to say what caused the plane to crash and that there should be no speculation until the investigation is complete — a process expected to take months. Russian President Vladimir Putin conferred by telephone with Cameron on Thursday about Western reports on the possibility of a bomb being aboard the Metrojet. A Kremlin statement said the two leaders discussed "joint counterterrorism" work. The Russian flight took off from Sharm el-Sheikh on its way to St. Petersburg on Saturday. U.S. satellites detected a flash of heat in the atmosphere at the time and place where the passenger jet — a chartered flight carrying Russian men, women and children home from their holidays near the Red Sea — dropped out of the sky. It crashed in the Sinai Peninsula. Metrojet spokesmen contend neither pilot error nor technical problems could have brought down the plane. Nonetheless, the company suspended all flights of its remaining four A321 aircraft Thursday, pending checks by authorities. 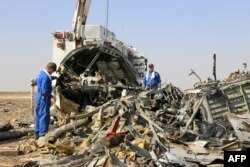 Experts are examining the Metrojet wreckage for any signs of terrorism. 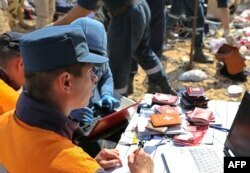 Some reports said forensic examinations had revealed shrapnel in some of the victims. The experts have retrieved both flight recorders. Islamic State has claimed responsibility for the attack, but it has yet to offer any evidence to back it up, and the claim was widely discredited. Sissi dismissed the IS claim as nothing but propaganda aimed at damaging Egyptian stability and security. Britain initially suspended flights to and from the area because of what officials said was "the significant possibility" that a bomb had blown the jet apart. In this photo made available Nov. 2, 2015, and provided by Russian Emergency Situations Ministry, Egyptian military forces approach a plane's tail at the wreckage of a passenger jet bound for St. Petersburg in Russia that crashed in Hassana, Egypt, Nov. 1. Russia's Foreign Ministry spokeswoman, Maria Zakharova, said it was shocking that Britain did not forward to the investigators all of its information about the Sinai crash. Cameron's office said Thursday, however, that British airlines would start flying stranded British tourists from Sharm el-Sheikh on Friday. British officials said they had reached agreement with Egypt on a package of new airport security measures that included flying passengers' suitcases on separate planes. Flights from Britain to the resort city are still suspended. Reports in the U.S. and Britain about a suspected bomb said the Islamic State terror group might have smuggled explosives onto the plane with assistance from someone at the airport. One U.S. official has said intercepted communications pointed the finger at the extremists. Islamic State has threatened attacks against Russia, as well as the United States, in retaliation for airstrikes aimed at the militant group's fighters in Syria and Iraq. In Washington, White House spokesman Josh Earnest said the United States had "not made our own determination, but cannot rule out a bomb." Earnest declined to discuss what U.S. intelligence officials had learned, adding, "We cannot rule out anything, including the possibility of terrorist involvement." U.S. Senator John McCain said Thursday, “There are certainly indications that this was a bomb, but I don’t think there is definitive evidence of that." "I don’t think there’s any doubt that, if it was a bomb, it’s ISIS [Islamic State] — proving again the threat of ISIS and the failure of this administration to do anything about defeating ISIS. It’s one of the many results of a failed foreign policy," McCain said. In Moscow, pensioner Natalia Ivanova questioned whether a terrorist group like Islamic State could be responsible. "I don't think [IS] had anything to do with it,” she told VOA. “I think it was a type of 'standard catastrophe,' if I may use that phrase. What does Syria have to do with it?" Other Russians are reconsidering plans to travel to Egypt, and there have been mass cancellations of tourist trips to the area. Surveyor Roman Dimaev said he would be scared to fly to Egypt but would likely still go. "Of course, if it is [Islamic State], then everything changes,” he said. “It means they're targeting Russian passenger liners." People react as they come to lay flowers in memory of the plane crash victims at Dvortsovaya (Palace) Square in St.Petersburg, Russia, on Wednesday, Nov. 4, 2015. Prime Minister Dmitry Medvedev instructed Russia's Transportation Ministry on Thursday to consider extra security measures for international flights by Russian airlines. Meanwhile Thursday, the first funeral of a crash victim was held near St. Petersburg. Friends and relatives buried the remains of Nina Lushchenko in the city of Veliky Novgorod.